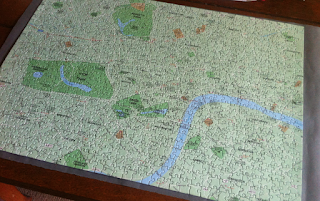 Last week, on Christmas Day afternoon, I cleared the table, poured the wine, and got to work on a PuzzleMap jigsaw of London that I'd found whilst rummaging at a charity sale last summer. I am happy to report that all the pieces were in the box but, oh boy did I find some other things amiss. The completed puzzle – 1000 pieces, 19"x27"
Having looked online at reviews for this item people say they really enjoyed doing the puzzle but found the image on the box lid hard to follow because it shows additional map at the left and right sides. Well, never mind that, dear WordSearchers, you should be more concerned with the inaccuracy of the place- and road-names and the confusion as to why so many insignificant streets, parks and locations have been identified as worthy for inclusion yet other, more important places, have been omitted, and where are the tube station signs for Oxford Circus, Bond Street, Chancery Lane and Hyde Park Corner? Ditto Marylebone and Fenchurch Street rail stations? Did they just fall off the map?! A crash (one of many) at the junction of Lyall Street and Chester Row. South Kensington tube stain has been renamed (who knew?) and there optional spellings for the Jameses. In the fourth pic four street names include extra/repeated letters: Roseberry St (+r), Skinnner St (+n), Centrral St (+r) and St. Johns St (+s). More errors include (with the correct spelling in brackets), Townshed Rd (Townshend), Edgeware Station (Edgware), Stanland St (Sandland) Plender Rd should be St and, probably my favourite, Long Acre St (delete St). You probably think I have studied the whole thing like a pedantic sub-editor with a fine-tooth comb – Nope! – I just noticed these things as I was doing it. It wasn't until I'd spotted about ten, when I had barely completed half of the puzzle, that I started jotting them down and then taking photos – this explains the changes in picture quality depending on available light at the time. I have spotted errors mainly in the central and north-east areas because I am not so knowledgeable about the south and south-west, so there must be lots more I don't know about. I wonder, how did all these silly errors slip though the net? It is fairly evident to me that it wasn't checked before it was printed. Existing maps such as the A-Z can't just be scanned and copied; there are copyright issues and so this had to be redrawn from scratch and, I suggest, in a hurry. Perhaps some of the mis-spellings might actually be mis-hearings with one person shouting the street names to another who typed them onto the map. Or, perhaps it was created as a task on The Apprentice?!! 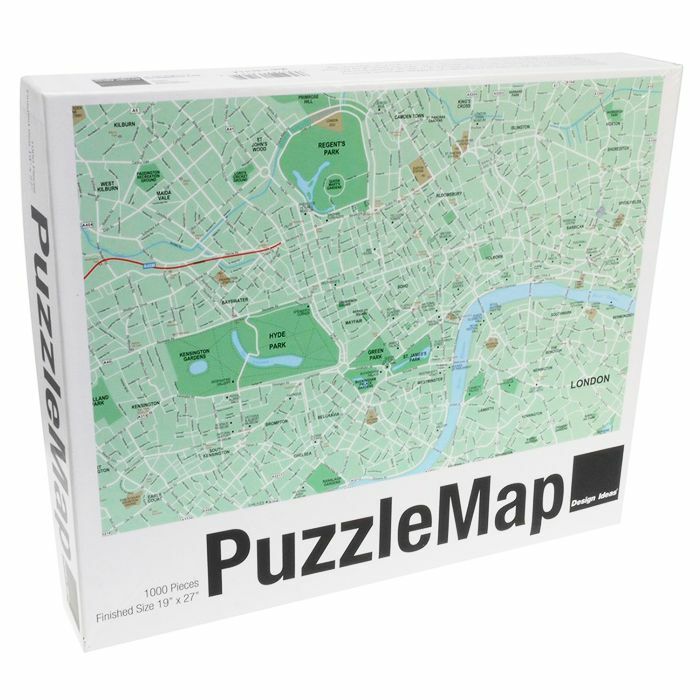 Learn the layouts of famous cities piece by piece as you assemble our PuzzleMaps with friends and family. Perhaps you are planning a trip and want to orient yourself before you go, or perhaps you want to remind yourself of favorite corners and neighborhoods you have explored on foot. The perfect gift for the person planning a first trip or the world traveler who knows a world class city from the ground up. 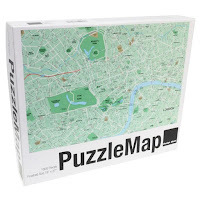 PuzzleMaps will challenge the best puzzlers, inspire curious minds interested in far off places and delight world travelers. Is it me, or does last bullet seem to contradict the fourth? You may have noticed the American spellings here and on the map itself such as Av as the abbreviation for Avenue – we Brits prefer to use Ave. Design Ideas Limited, the company that produced this puzzle, is indeed American and, according to the box, is based in Springfield*, Illinois. But they must have internet access over there and they must have access to maps of London. It's inexcusable. Though quite amusing too. I am going to leave the finished puzzle on my table for a while yet – it sort of pleases me in a supercilious "I know better" way. Perhaps I'll write to Design Ideas and suggest that it could form the basis if another type of puzzle all on its own; a sort of cartographic spot-the-diffence as part of a range called MapMistakes or StreetSearch...?! *Incidentally, Springfield is not just home of the Simpsons, it's [something like] one of the most common town names in the U.S. – probably why Matt Groening chose to use it.